The Great Wall at Night taken by GWR official photographer MARK SOLLY. For nearly three years our Wall remained free of graffitti and damage - then in one night 63 paintings were attacked by persons unknown. Why? Good question. The Wall will recover. 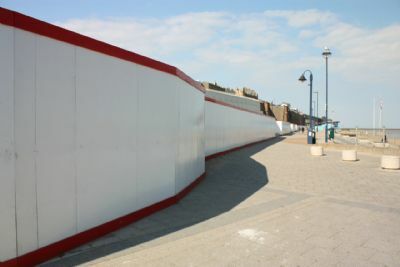 This is the People's Wall, the people of Ramsgate's Wall. 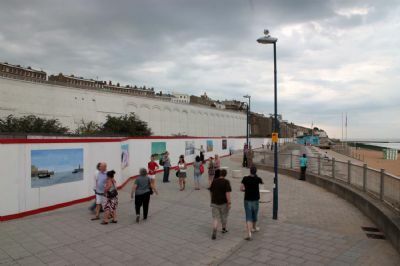 The community and people of Ramsgate will restore this Wall. 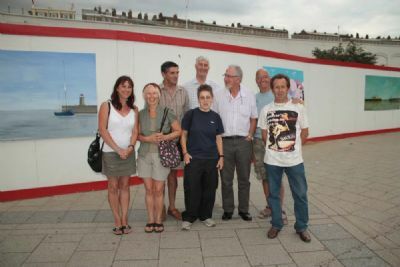 "The Great Wall of Ramsgate is fabulous – art in action with artists professional and amateur, old and young, brilliant and quirky. 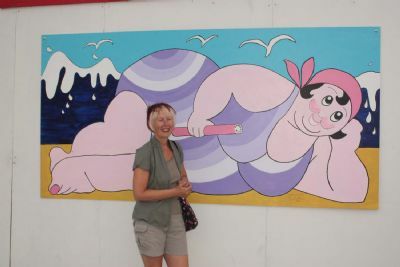 Don’t visit East Kent without coming to the Ramsgate Sands and enjoying the great art!" 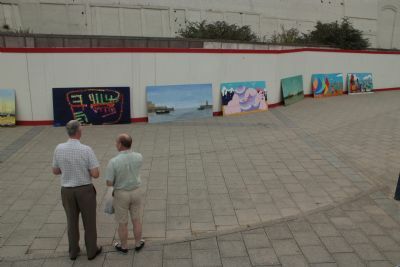 Another TEN paintings went up on Sunday, 31st July. 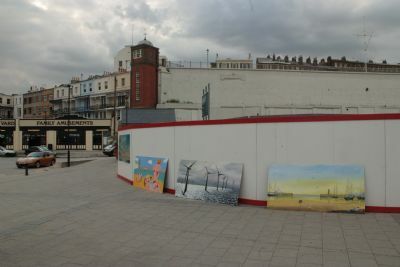 Paintings of the West Cliff Lido, The Model Village, a colláge of Van Gogh's Ramsgate sojourn, a thirties-style poster of the Sally Line, Two Merpeople, Townley House, Chilton, Ellington-Hereson and St Ethelbert's schools and Windsurfers. Garth produces new graffiti on Eastern end of Wall. Welcome to Ramsgate. 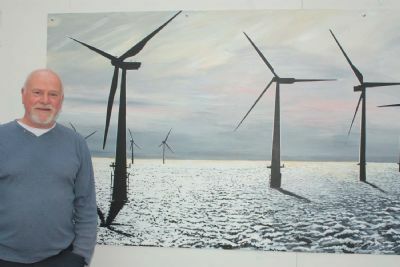 On Sunday the 26th June 2011 another seven paintings were hung on the WALL taking the total, so far, to 102. 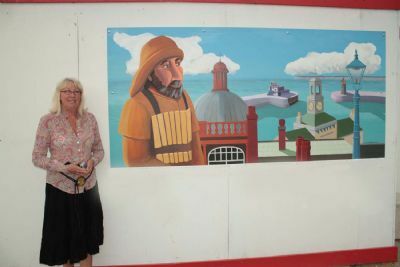 Paintings by Ursula Allen, Jean Wisker, Newlands Primary School, St Peter’s Primary School, Bernie Pendle, Lynn Webster and Gillian Glassborow were ‘unveiled’. We managed to squeeze them in. 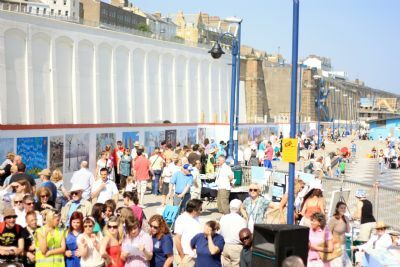 On the 23rd April we officially 'unveiled' the Great Wall of Ramsgate, the largest open-air art gallery in the country. 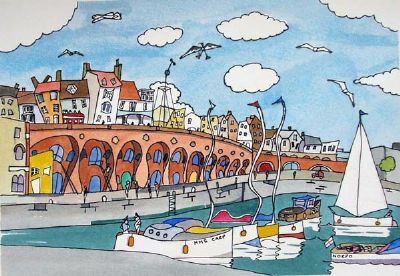 I am very proud to have led the team that produced this amazing and fantastic display of local artists celebrating Ramsgate, past, present and future. Charles Newington, the artist responsible for the Great White Horse of the Hill overlooking Cheriton declared the Wall open. 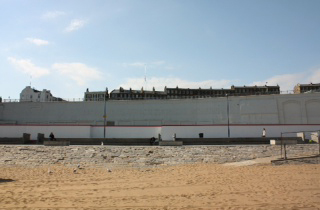 We thanked all the artists, sponsors and the members of the Great Ramsgate Public who made this Wall possible. According to one Blog it can be see from incoming aircraft. What an advert for Ramsgate. Not a penny came from the public purse, nor did we ask for any. We were determined that this should be a community project that we could all take pride in. It is a great achievement. We have always believed in Ramsgate and now the rest of the world can see what we can achieve when we put our minds to it. Looks easy doesn't it? Just a piece of cake, isn't it? HELP! Ever had one of those moments when. perhaps, over a drink in a local pub, you all have this great idea and everyone gets excited and ideas flow like the Nile in flood. Then, the next morning, over a cup of very black coffee you suddenly sit up and cry, like a voice from the deep, "what have we done?" That was the GREAT WALL OF RAMSGATE. After all it is only 1100 feet of very blank wall we had committed ourselves to painting. Were we CRAZY? Harbour by Mike Samson - This hit the spot. All we had to do now was hang more paintings along the rest of the wall, see below. Piece of cake. 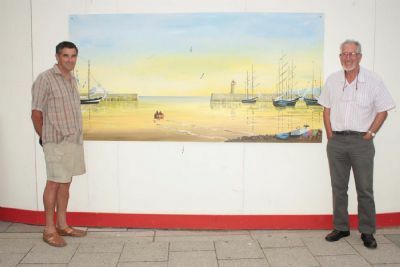 Well thanks to Mike's Acol Art Group we had a number of artists who were willing to paint. All we had to do was raise the funds to pay for the boards and paint. Another piece of cake. Well, as our existence is proof that life evolved on Earth so the existence of 55 paintings, so far, is proof that we raised the funds to cover our costs. That in itself is a creative process. Begging can be an art form. "Ah go on, go on, go on..." Persistence, or harasment as some might call it, pays off. 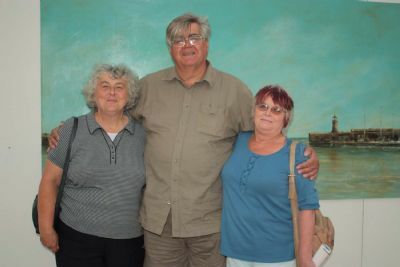 On the 28th July 2010 another consignment of paintings arrived at the wall. At last we were starting to make an impression. However, ever mindful that there's often a slip between cup and lip we decided to double space the paintings so they stretched further down the wall. It did look good and we were beginning to feel proud of ourselves. We weren't just talkers - we were doers. "Did anyone remember to fetch the screws?" "Me neither." Yes, someone did fetch the screws. So up they go. Left to right. Mike Samson, Gerry O'Donnell and Peter Buckey. Peter and I have the best legs. 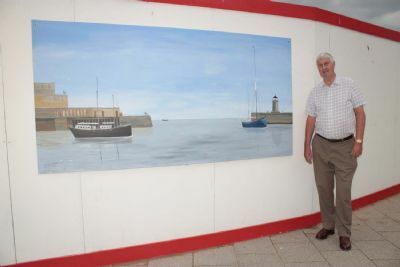 It was bringing Mike Samson aboard as our Art Co-ordinator that helped give the Wall a big boost. His Art Group, Acol, were the first to exhibit en masse, if they don't mind the expression, and that fed the interest of other artists. Acol Art Group en masse. A fine body of men and women. 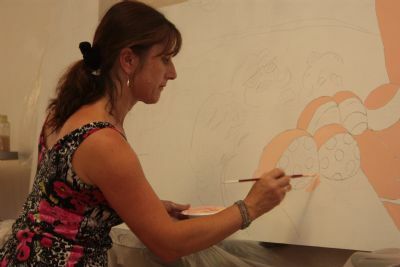 Linda painting her work before the 28th July Hanging. 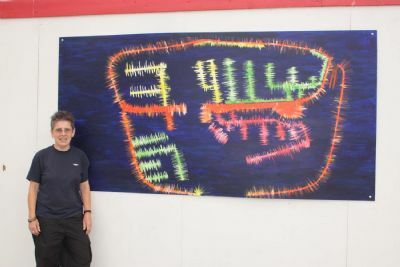 Some more artists standing next to their work. Our first day of hanging was over. What a relief. You know the old saying 'supposing we threw a party and no-one came'. Well from now on everybody wanted to come and paint and we were beginning to worry that we might run out of wall.